Unlike in previous posts, slowly we will move from easy to more complex subjects. In this process, today we will discuss the Basics of Options and Option Trading. Option Trading is the most fancied style of trading for any person who trades in the stock market. REASON: IT IS THE EASIEST WAY TO EARN BIG BUCKS. But Wait…… IT IS ALSO THE EASIEST WAY TO LOSE BIG BUCKS TOO, if you are not careful or you do not understand the whole concept of Options Trading. As your well-wishers, we at Moneypalm always believe that all our clients, who are a family to us, should not lose their hard earned money. Infact, we want to see all of you earn, and earn well to bring smiles on your faces as well as ours because we always believe in our philosophy – “Together We Grow”. But for that you need to thoroughly go through this page and understand it deeply. The definition says: An option is a contract that gives buyer the right, but not the obligation, to buy or sell an underlying asset (a stock or index) at a definite price on or before a specified date. ???????????????????????????? ……………………………….. I know this must be your position after going through this definition. This is the same position that every beginner goes through, when they start trading in options. But sadly, people generally resort to just speculating rather than understanding the whole concept of options. This even goes with many professionals. But this actually is a very dangerous situation. It’s the same thing where a boy knows how to drive a car, but does not know the basic traffic rules. But we will not let the situation arise. We will understand the traffic rules first, before we drive. So, coming back to the topic ………. 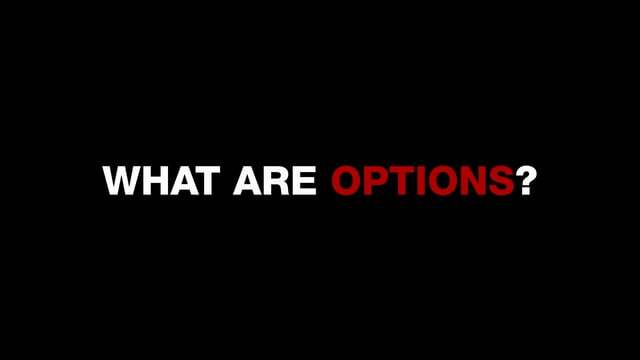 Let’s understand how options work with the help of an example. Let us assume (and we really wish so), that trading with Moneypalm, you have earned a great deal of money and are planning to purchase a very beautiful Penthouse in outskirts of Gurgaon. But sadly, you will take another 3 months to amass the money to purchase it. So, with the help of Moneypalm Reality Pvt. Ltd., You negotiate a deal with the builder, that gives you an option to buy the house in next three months for a price of Rupees. 1 Crore. The builder agrees, but for this option, you have to pay a premium of Rupees 1 Lakh. Considering the rise in property rates in Gurgaon and the Beautiful Penthouse, you agree to pay the Rs. 1 Lakh to go for the deal which gives you the right to Purchase the house after 3 months. Here, Penthouse is the Underlying Asset. Rs. 1 Crore is the Strike Price of the Underlying. And Rs. 1 Lakh is the premium that you pay to get an Option to buy the penthouse within next 3 months. And since you get an Option to buy – It is called a Call Option (We will come to it in some time). 1. After buying the option to buy the penthouse by paying the Premium of Rs. 1 Lac, Govt. comes out with a policy to develop that area and make it the main residential and commercial hub. This announcement stirs the Real Estate Rates in the area and the price of the Penthouse shoots up to Rs. 5 Crores. But since Moneypalm Reality Pvt. Ltd had already got the deal for you by buying the option by paying a premium of Rs. 1 Lakh, the builder is obligated to sell you the house for Rs. 1 Crore only. This means you straightaway made a profit of Rs. 3.99 Crores (Rs. 5 Crores – Rs. 1 Crore – Rs. 1 Lakh). 2. After buying the option to purchase the penthouse, you finally receive your Permanent Resident Visa for USA, for which you were trying so hard since years and you have to shift to USA immediately or you’ll lose the chance to work with Google Inc. You decide that you should rather save your money, so you can buy a house to live in New York City. So finally you decide to let go of the Penthouse as you are not under any obligation to buy the house. But in the process you lose your 1 Lakh rupees only. With the help of above examples, we have understood two very very important points. 1. When we buy an option, we have a right but not an obligation to do something. 2. An option is just a contract which derives its value from the underlying asset. Because it derives its value from something else, it is called a derivative. When we talk with reference to the Stock Market Scenario, the underlying asset can be a stock or index. We hope that the whole concept of Options is now clear to you. And we are sure now you are extremely interested to know more about Options and want to plunge into the depths. If so, just keep following TradeTalk as we will take this topic further in our upcoming post. Till then, have a Happy and Profitable time trading with Moneypalm.